When their kitchen is smaller than average, many people think that they will not have enough space to fit all the regular appliances. Is it possible to fit a washing machine, dryer, refrigerator, or even a dishwasher into a small kitchen? Thankfully yes! Sure, you may have to move a few things around and you will have to be clever with your free space, however with modern appliances being available in all different sizes, it means there is a size to fit all kitchens. For some people a dishwasher might seem like more of a luxury type of appliance, especially if there is limited space in a kitchen. However, this doesn’t have to be the case. A compact dishwasher is a lot smaller than a regular size dishwasher, yet it has all the benefits. In this article, on the Best Compact Dishwashers For Small Spaces 2019, we will be looking at some of the most popular countertop, slimline, portable and compact dishwashers available on the market. One of these mini dishwashers will fit nicely into an area of your kitchen and will provide all the convenience and benefits, without taking up too much space. Lets face it, for most of us, dish washing is a chore and no matter how good you are at it, the dishes never end up as spotless as a machine washed dish. This small countertop dishwasher by SPT is a bestseller on Amazon and appears to be a very good choice. Lets have a look to see why it is so popular. First of all, the dishwasher measures 17.25” H x 21.5” W x 19.75” D and has a 6 place setting. This is a nice compact size, however these measurements appear to be universal for compact dishwashers. Anyway, you don’t want it to be too small or you won’t be able to fit enough dishes in it . The unit weighs 48 lbs when completely empty. If you plan to place the dishwasher on a countertop, then the weight is irrelevant, however if you plan to place the dishwasher on something less solid, make sure it can hold the dishwasher weight, the dishes and the water. This weight could reach up to 100 lbs. 10.5” plates will fit inside without the need to slant them. 11” plates should fit fine if slanted. There are six cycles to choose from and some of the wash cycle times may appear quite long, however if you don’t want such a thorough cycle then you can choose one of the shorter ones. The Heavy wash cycle has the longest washing time of 100 minutes. This time includes a double wash cycle and one heated dry cycle. The Normal Wash Cycle (85 minutes), the Light Wash Cycle (75 minutes) and the Glass (70 minutes) all include a Heated Dry Cycle. The Speed Wash Cycle (45 minutes) and the Pre-wash (10 minutes) do not have a Heated Dry Cycle. The sound of the actual machine washing the dishes is very quiet. There is some noise when the dishwasher is emptying the water into the sink but that’s about it. In fact, the sound of the dishwasher running will make you question if it is even on a wash cycle, it is so quiet. This compact dishwasher by STP is a nice little appliance that works well and will conveniently slot into a corner of your kitchen. It is quiet and gets the job done. The wash cycle time may take awhile, however if this is an issue then maybe a Speed Wash Cycle will do for you and then let it drip dry for 30 or so minutes. Overall, this popular dishwasher is a good choice for two or three people living in a small apartment. Why would you want a portable dishwasher? Well, think about the convenience of rolling in a dishwasher when it is time to wash the dishes. Just roll it up, connect it to the kitchen faucet and it is ready to go. When the washing is done, roll it off to the storage area until the next time. No countertop space is taken up, no small kitchen ground space is taken up during the time its not in use. In a nutshell, portable dishwashers are very convenient. The overall dimensions of this dishwasher are 17.72″W x 25.98″D x 36.02″H. Compare this to the the SPT countertop dishwasher above at a measurement of 21.5” W x 19.75” D x 17.25″ H. This SPT portable dishwasher is a lot higher, has more depth but is also more narrow. The power cord is 5 ft in length and the drain tube is 3 feet in length. Empty, the dishwasher weighs 121.3 lbs. There are 6 programs to choose from, with the heavy duty cycle running a 2 hour wash. It doesn’t have a drying cycle but uses the heat from the final heated cycle to dry the dishes. However, we recommend opening the door for a little while after the cycle ends to air it out and the dishes should dry with the mixture of heat and air. Very quiet and efficient. It does its wash cycle with virtually no noise. This portable SPT is a bit more expensive than the countertop SPT reviewed above, however it is larger. For a small dishwasher it is quite spacious and can fit a decent size load. The cycles can take a while to finish, however it does a great job of cleaning. Also, it doesn’t have a drying cycle and some customers had the minor complaint of the dishes not being completely dry when the wash cycle was completed. This was not a deal breaker and with a few minutes of heat or air drying, the dishes should be completely dry in no time. This portable dishwasher by SPT is convenient and great for small spaces. Not only is it a lot smaller than a regular size dishwasher (great for storage), but it also can be conveniently rolled in and out of the kitchen when needed. 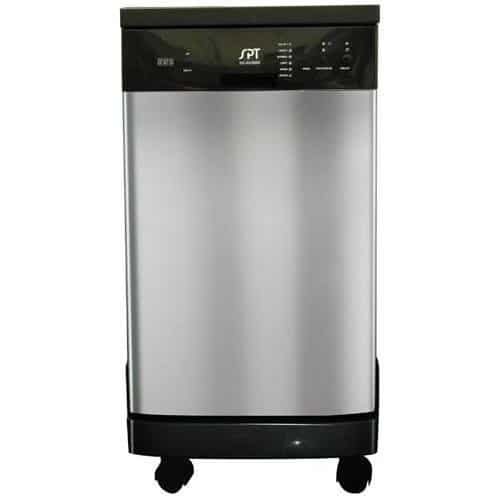 This 18”, 8 place setting dishwasher by SPT is an ideal choice for small kitchens. If you want to have the dishwasher permanently set in place(instead of a portable or countertop kind), then this may be what you are looking for. It is a bestseller on Amazon for ‘built-in dishwashers’ and at 18” wide, is a good space saver for small kitchens. The unit measures 22.1” D x 17.5” W x 32.2” H and has an empty weight of only 54 lbs. The depth with the door fully open is 44.5”. It is quite slim in design but has enough space inside for a small family. With an 8 place setting, it has decent room for dishes. The dishwasher has 6 Wash Programs to choose from: All-in-1, Heavy, Normal, Light , Rinse and Speed. However it does not have a heat drying cycle. The unit uses residual heat drying, which utilizes the heat remaining from the final rinse cycle to dry the wet dishes. The dishwasher has a noise level of 55db, which is pretty quiet. It has two racks to place dishes on and a silverware basket that holds utensils and silverware. It also has a handy automatic detergent and rinse agent dispenser and two spray arms for complete cleaning coverage. Finally, the time delay feature: allows you to program operation at a later start time (1-24 hours). This slimline, built-in dishwasher by SPT is a good value unit, that is an ideal choice for small kitchens. It is easy to install and does an effective job of cleaning dishes. It doesn’t have a drying cycle, however, this should not turn you off this dishwasher. The residual heat from the final wash cycle will heat up the dishes enough that they will pretty much dry themselves after a few minutes. Overall, this bestselling built-in dishwasher is a great choice for small spaces. 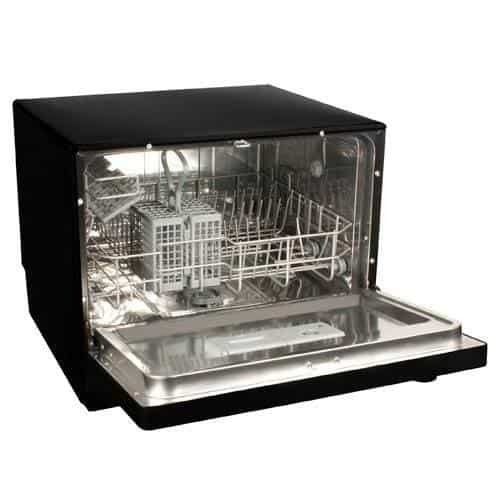 This compact dishwasher by Koldfront has a 6 place setting and will fit nicely on top of your countertop. For a reasonable price, this unit works well and is highly rated. Its dimensions are 17-3/16″ H x 21-11/16″ W x 19-11/16″ D, which seems to be a pretty much standard size for these countertop dishwashers. Its 6 place setting is on the higher end for a compact dishwasher and should have enough space for 2 to 3 people. It holds up to 10.5” diameter plates and includes a dish rack, a cup shelf and a cutlery basket. It has 6 wash cycle programs to choose from, with longest cycle taking roughly 90 minutes to complete. Some of the cycles also have a heated dry cycle after them. The dishwasher uses only 200 kilowatt hours per year, which is approximately 61% less energy than similar countertop dishwashers. Also, it wastes very little water, which can save you a lot of money on your water and energy bills. It is very quiet while running and has a timer that goes off when the cleaning cycle is complete. Overall, this is a very nice little dishwasher that is perfect for small kitchens. It will fit nicely on countertops or in cabinets. It is compact in size compared to regular size dishwashers and will be suitable for 2 to 3 people. Its performance is quiet and efficient and is highly rated by customers. If you are looking for a decent priced, small dishwasher suitable for small spaces, then this one by Koldfront is a great option. This budget dishwasher by SPT is roughly $50 cheaper than similar units. It has some positive ratings, is similar in size and also has similar features to the rest. The unit measures 21.65″W x 19.69″D x 17.24″H and weighs 43 lbs. This is more or less the standard size for these compact dishwashers. The power cord length is 4.5 ft and the drain tube length is 5 ft. This dishwasher has 6 wash cycle programs: Heavy, normal, light, miniparty, rinse and speed. It doesn’t have a heated dry cycle, however it does use residual dry heating. Similar to the previous dishwashers, residual dry heating dries the dishes with the heat of the final wash cycle program. Energy consumption: 203 kilowatt hours per year, which is excellent for energy savings. Spacious cavity loads up to six standard place settings. The unit has an automatic detergent and rinse-aid dispenser. It will also connect to most kitchen faucets and eliminates the need for direct plumbing or permanent installation. This budget dishwasher by SPT saves you some money compared to similar units. It is similar in size and features, therefore appears to be a good buy. 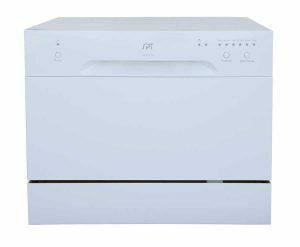 This dishwasher is suitable for small apartments, small offices and small kitchens. Why would you need a double drawer dishwasher. Well, its not everyday that you will need to wash a large load of dishes, so it can be very convenient to have the option to wash dishes for just two people. However, lets say you have guests over for dinner once a week. 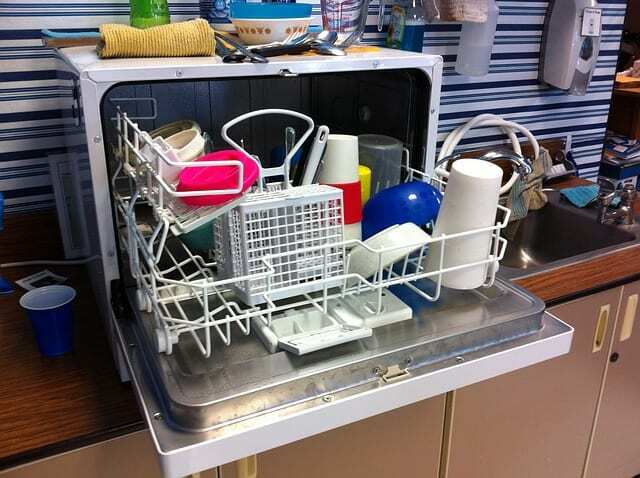 Well, then you can use both sections of the dishwasher to clean up all the dishes at once. 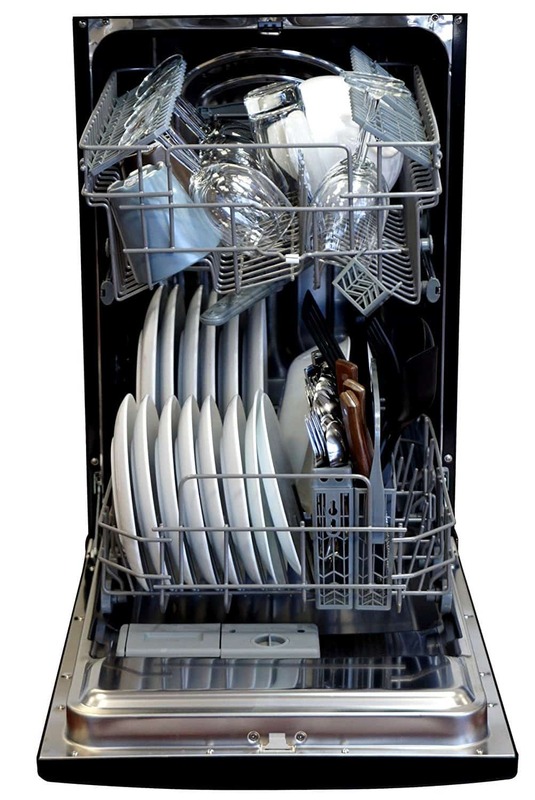 A double dishwasher is just very convenient and saves energy when washing smaller loads some of the time. Another benefit of having a top and bottom drawer, is the ability to use the top drawer most of the time. By using the top drawer, most days, it saves your back from having to bend down and straighten up with every dish. With measurements of 22 9/16″ D x 32 5/16 – 34 5/8″ H x 23 9/16″ W, you can see that it is the size of a regular built-in countertop depth dishwasher, however the beauty of this one is that it has two separate drawers. The company references this appliance as having dishdrawers because unlike regular dishwashers, these drawers pull out like regular drawers. They are ergonomically designed for minimal bending and excellent for saving your back. This compact dishwasher has 9 wash cycles to choose from and is capable of washing anything from fine glass and crystal to heavily soiled pots and pans, at the touch of a button. The spray arm rotates at different speeds depending on the wash cycle chosen, so you are guaranteed awesome results. 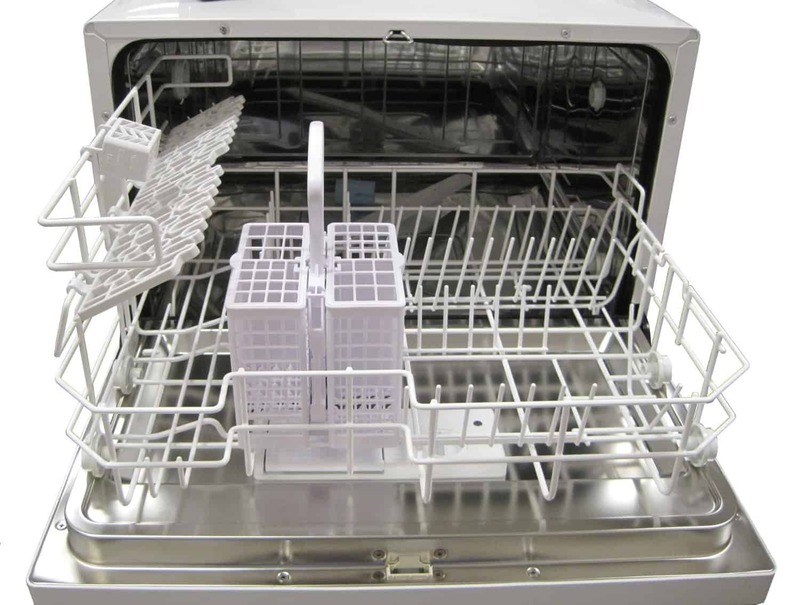 The dishwasher has few moving parts, which not only ensures a very quiet wash but also means it is less likely to have any problems over time. A flexible rack system allows you to set up the racks the way you want for specific loads. For example, if you want to wash pots and pans, the racks can be easily flattened to accommodate the larger pans. If you want to wash some dishes and cups, then set up the rack accordingly. The fan assisted drying option means your dishes are ready for use or put away, straight after a wash cycle. Has 14 place settings and can accommodate plates of up to 11.5″. Noise on gentle cycle top drawer = 45 dBa. Although, the most expensive dishwasher reviewed, it is certainly an awesome appliance. The two drawer mechanism is a great option for having separate smaller wash loads or larger loads, when necessary. I love the pull out drawers and the easy load ergonomic design. Performance wise it is awesome – so quiet and energy and water efficient. 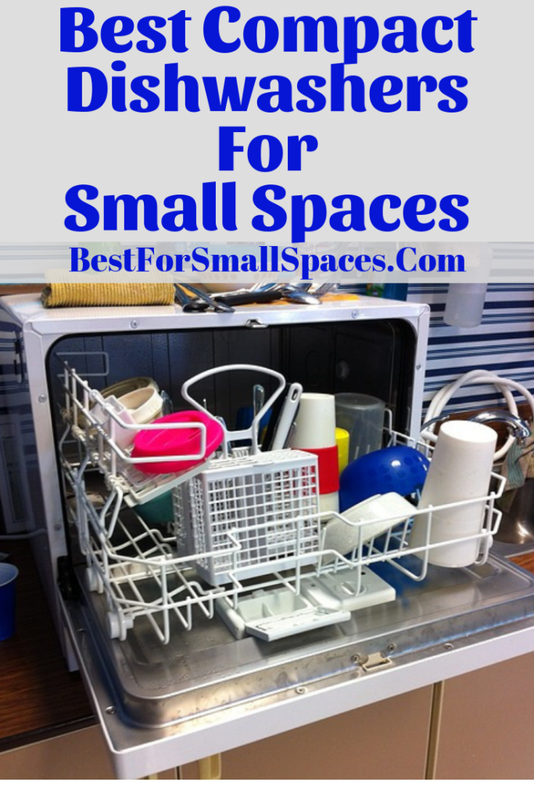 Another bonus for small spaces is that even though it is similar in size to regular counter depth dishwashers, it still has 14 place settings. 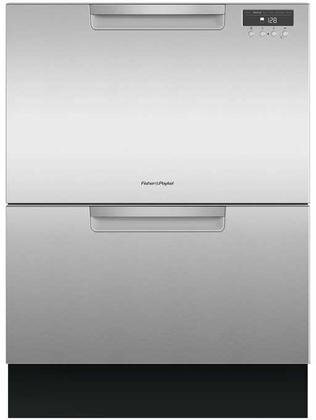 If your budget is a little higher, then this awesome dishwasher by Fisher & Paykel is definitely worth considering. To have a look at the price and customer reviews, click for more details below. The first thing to consider when searching for a dishwasher, is where are you going to put it. There are three types to choose from: a countertop, a portable, or a built-in dishwasher. Each of these types of dishwasher can be found in a compact or slimline size. Even though these compact dishwashers are smaller than the average full size dishwasher, they may be larger than you imagine, therefore it is advisable to measure the area you will place the dishwasher, to make sure you have enough room for the unit. Also, the inside of the dishwasher will have different place settings. Full size dishwashers usually have a capacity of 12 to 14 place settings, while a slimline might only have 9. Compact dishwashers tend to have a 4 to 6 place setting capacity. The compact dishwashers in this article have a 6 place setting and are suitable for 2 to 3 people. If you will have more than this amount of people using the dishwasher, then maybe you will need to consider a full size dishwasher. If you would like to see some more compact appliances, then why not have a look at these compact washing machines or mini fridge freezers. 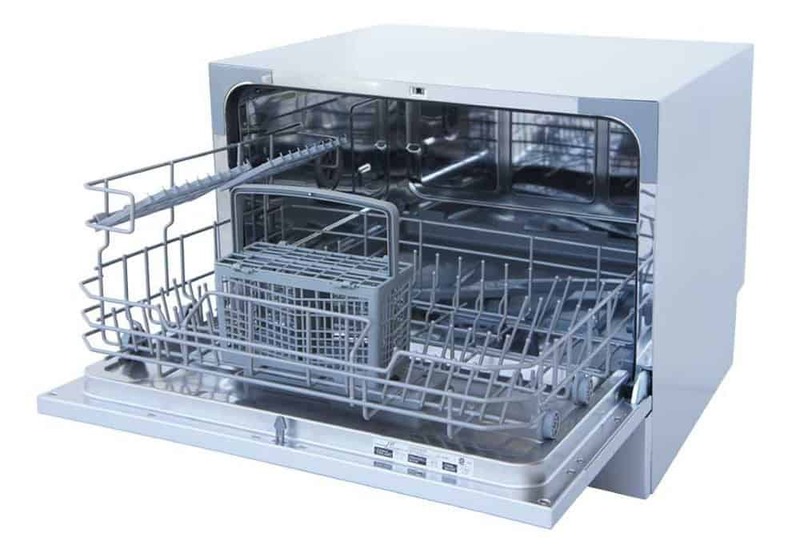 Hopefully you found this article on the Best Compact Dishwashers For Small Spaces 2019 helpful and got an idea on which dishwasher would be suitable for your home.